I travel to a different show virtually every week, so I am constantly on airplanes (this week L.A., next week New York for the NY Auto Show). 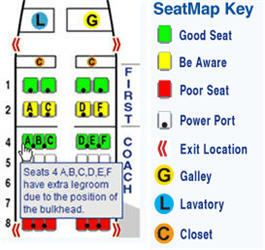 Of course with a cross country flight I want to make sure I have a good seat, preferably with a power port. You may have noticed that some seats seem better than others – I have. After booking my flight, my first stop is SeatGuru.com. With your airline and flight info, look up the seating chart for that airplane, make sure you do not have a ‘yellow’ seat, check if it has a powerport and make sure you have the best seat in your category! Which Projector Should I Buy? This is a common question I get a lot. And because PowerPoint and Projectors are almost synonymous, I thought it might be good to give my standard answer here. I recently posted the below to the ‘What projector should I buy’ question in the PowerPoint Newsgroup. 6. Quiet Mode; this is good if projector is used in a small setting, as it limits the output power, but also runs near silent. 10. Warranty, carrying case, etc. 5,000 Patents and going strong! But it does make Microsoft “among the top five technology companies in terms of patent filings.” That’s a lot of paper work – and I bet it is not doing much for the ‘paperless office…’ Here is a good write-up on the Microsoft milestone. The Winter Olympics are here and all the excitement has begun. Google has a cool collection of all the highlight videos. Check it out daily here.